Having spent this semester working on the editorial board of my university’s literary journal, I’ve learned a lot about the behind the scenes process of literary publishing. I’ve also learned that a great number of lit mags, despite passionate founders and great literary art on their pages, fail within their first year(s). For a while, this rate of failure dampened my attitude that great art can always find an audience. But it also made me start thinking about ways that literary magazines can adopt a bit of marketing savvy to better get their art into the world. Because even creatives have to think like marketers if they want to get the attention they deserve. And there are definitely some literary magazines out there that are getting it right when it comes to marketing strategy.They are building a community around their magazine by creating useful, entertaining, and informative content that tells (and inspires others to retell) a brand story. Take for example, Paper Darts Magazine in Minneapolis.Their Facebook page and blog are visually-stunning, packed with beautiful images, good writing, links to all things cool and literary, and, basically, just lots of really interesting content. Their pages make me want to read whatever they recommend, make me wish I was friends with the women who run the magazine, and make me want to share what I discover through them with my network. Engaging with their content is like chatting with an artsy friend with great taste, who keeps me up to date on the latest literary trends. The Normal School, a biannual journal affiliated with California State University at Fresno, has a similar effect on me as a reader. 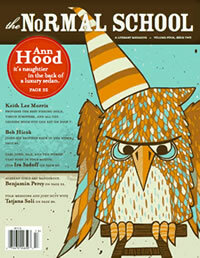 Their website is packed with their unique personality, and they pay great attention to the journal’s visual identity, which editor Sophie Beck calls “tweaked American nostalgia.” To make the magazine more accessible and boost sales, they designed it so that it would look more like commercial magazines: The Normal School is bigger than most literary journals and so is the masthead on its cover. Within the journal, they chose to break up the page to invite readers in at multiple points by using a three column layout and pull-quotes. Ads and boxes of poetry provide visual variety. (Also, coincidentally, they use the same font as the New Yorker. Love it!) And each issue features a “Reader’s Guide”—a two page spread that maps out all of the essays and stories in the magazine and summarizes them in bullet points. This gives the reader the opportunity to quickly find what they might be interested in reading, instead of being unsure where to start and tossing the magazine aside. Magazines like these—that use good design and great content to invite in and engage readers—offer models that other literary magazines can take benefit from. Heck, models that most artists, creative professionals, designers, and content strategists can benefit from. Because, more than anything, they are conscious of their audience. They are “creating outward,” as I call it, thinking not only of what will satisfy them personally as artists, but what will interest and inspire others. So let’s borrow some ideas from these literary magazines, and “create outward” ourselves!